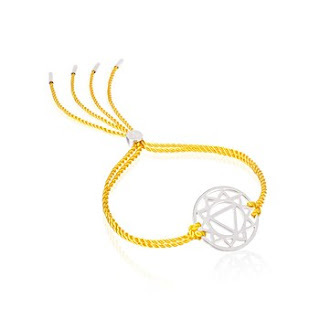 My favourite bracelet to take on holiday and wear in the summer is my Daisy Chakra bracelet. The cord is soft, and it's comfortable to wear in hot weather as you can adjust the length to what feels comfortable. 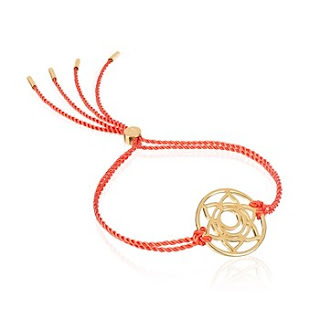 Each bracelet features a Chakra symbol with a colourful cord to add some personalisation. My own choice was to go for the black cord with the gold throat symbol for honest expression, loyalty and organisation. 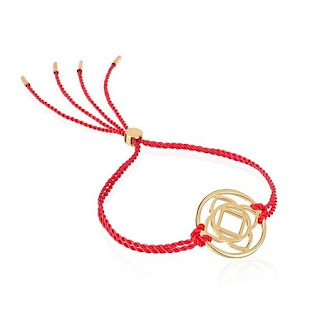 It's definitely the iconic piece from Daisy London as these bracelets were initially launched in 2011 and have become known as the original Charka bracelet. Coupled with the recent increase in the importance of wellness, mindfulness and balance this bracelet personifies these ideas. The chakras are from eastern philosophy and correspond to organs, zodiac signs, emotions and personality traits. They are the perfect symbol of modern day wellness as we strive for an authentic and unique existence more than ever. 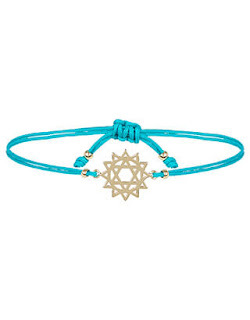 I noticed that Accessorize had a chakra bracelet which has a remarkable resemblance to the Daisy London classic icon. The price tag between these two bracelets is not so significant when comparing to other save or splurge articles that I've written, but enough to stop some people splurging. 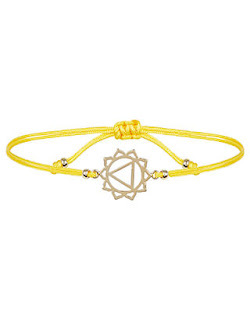 A gold vermeil Daisy London chakra bracelet is £86, and the sterling silver is £58 where as the Accessorize gold-plated brass bracelet is £10.00. Between the most expensive bracelet and the Accessorize bracelet, there is a £76 price difference. At the end of the day ask yourself do you want to support the original designer, do you want a bargain, how often will you wear this and what is this jewellery made from. Regarding the design differences between these bracelets, the adjusters are entirely different. 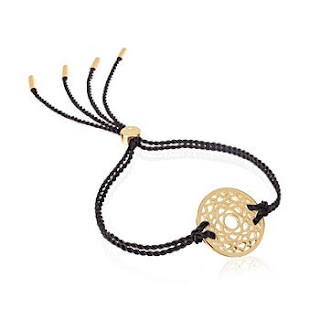 The Daisy London one has a minimal adjust made of gold vermeil with the caps on the end of the cord while the Accessorize one has a knotted adjuster which looks a little more casual. 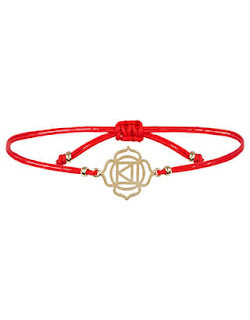 The Accessorize bracelets have a more minimalist design for the chakra symbols which brings out the difference between each chakra symbol. The reason for the big price difference is definitely the materials these are made from. 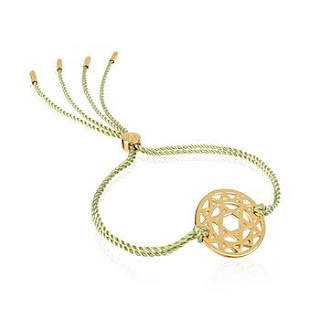 The Daisy London bracelets are sterling silver and gold vermeil (really thick gold plated sterling silver). These materials are popular due to their durability and affordability. A word of warning for gold vermeil is that the plating will come away if you smother your sun cream over the metal or if you swim in it every day. Once won't be a problem for this plating technique will last years if you care for your jewellery and are mindful of these. 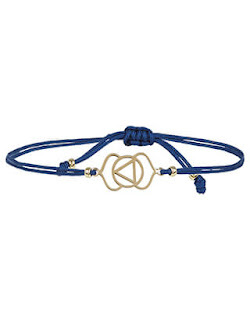 The Accessorize bracelet is listed as gold plated over brass, and I would guess not that thickly plated. I imagine that after a summer or maybe years wear this will have dulled and come off. A point for Accessorize for stating that the cord is made from Rayon. Daisy London doesn't mention the cord material composition, and I would have expected to see this. I do love my Daisy London bracelet and feel lame and cool at the same time when I've worn it to Pilates or even as an anklet on holiday. The design is not too minimalist or loud, so I don't see this bracelet going out of style or also moving away from my personal taste in jewellery. For £86 it's not a bad piece to invest in, and if you're looking to buy yourself a piece of designer jewellery, then it's a great introduction piece. I do also think they make great gifts and you could buy one for your sister/mother/girlfriend based on the good thoughts that you wish them. I'd love to see longer cords and perhaps a slightly bigger charm so that men can wear them as I don't think these are limited to just for woman. If you want one just for the summer or perhaps if you are thinking of getting these as adorable hen party favours then I'd opt for the Accessorize bracelet. Knowing you can wear this in a pool, on the beach and in the sea without worrying about the cord becoming damaged is a great relief and for £10.00 they really are an excellent pocket money purchase. I've been through the entire collection from both Daisy London and Accessorize and matched up a bracelet from each. Scroll through to see all the colours and symbols and find your chakra. 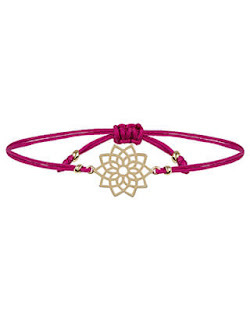 The crown chakra is associated with the colour purple, hence the magenta cord on the Accessorize bracelet. As you might have guess this symbol is located at the top of your head or at the crown of your head and also with the brain. The floral design is very feminine and intricate and is linked to the ideas of enlightenment and peace. In terms of health issues this symbol is considered for those who suffer from migraines, depression, bad skin or lack of inspiration. Perfect for the indecisive friend, the cynic among you, or a friend whose going through a rough time. As you might have guess this bracelet is associated with the brow of your head and where you third eye would be. Sometimes I think I should have picked this symbol for myself and I imagine that my eyebrows would be on flique, which is obviously very silly. The colour strongly linked to this symbol is purple. The emotional connections to this bracelet are insight, self-realization and releasing negative thoughts. If you're loving the sound of this bracelet already it's for those who are a fearless or those that need a little clarity in their life. Health wise the brow symbol is similar to the crown symbol and is worn by those who suffer from migranes, ear ache or eye problems. When I first came across this collection the throat symbol was the one that grabbed my attention. I love the meaning behind this bracelet as well as the design. This bracelet is linked to you throat and your voice. It encourages clear and effective communication and is linked to anxiety and self expression. This feels more meaningful when you realise that the throat chakra sits between your crown and heart chakras. The physical place between our heads and hearts. I am an anxious person and I find it difficult to articulate my self when I'm speaking to people so this symbol resonated with me on such a personal level. 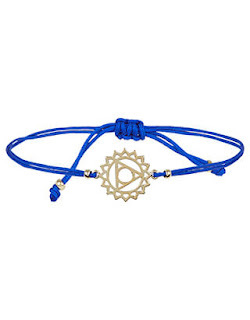 The colour of the throat chakra is blue and it's also associated with shyness, integrity, fevers ans weariness. The heart is the 4th chakra which puts it smack bang in the middle of the other six. When it comes to deep meanings this symbol stands alone. It's linked to emotions and feelings such as love, self-control and forgiveness. Unusually the colour for the heart chakra is green. I would have guess red or pink. This makes a lovely gift for a long term friend as it stirs up sentimental and compassionate feelings over romantic ones. Health connections to this symbol are poor circulation, loneliness, immunity problems. Your solar plexus is located just below your chest. If you haven't guess the linked colour yet, I'll give you a hint. It's yellow. Themes and emotions connected to this symbol are personal power, self-confidence, and the ability to have self-control. This could be a reward for giving up smoking or achieving a health goal such as a weight target. Health links to this symbol are stomach pains, diabetes or control issues. 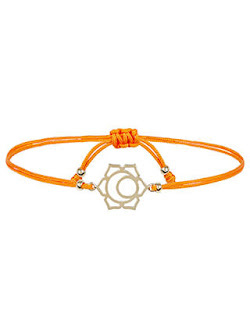 The sacral chakra is located below your navel and gives this symbol an intimate meaning of passion and closeness. This bracelet is also associated with isolation, loneliness and lack of creativity. The linked colour is orange which is a colour that you wouldn't normally associate as a romantic color or as one of loneliness. This makes it a perfect gift for someone special who doesn't wear conventional jewellery or prefers to wear something which is less obviously a romantic token. Located at the bottom of your spine this bracelet is linked with ideas of stability, family values and strength. Did anyone else think #strongandstable? I love that red is the colour for this symbol as these emotions are often linked to primal feelings of survival and instinct. It's also associated with health issues such as fear, joint pain, anorexia and back pain. 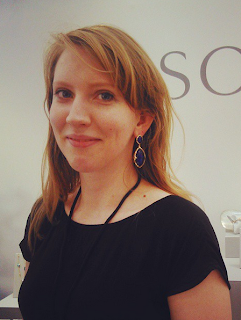 Speaking of summer jewellery have you been keeping up to date with the Jewellery Curated summer holiday series. This month I'm posting every other day with features on how to be a mermaid, my favourite gemstone to wear on holiday, the most elegant holiday jewellery and so much more. 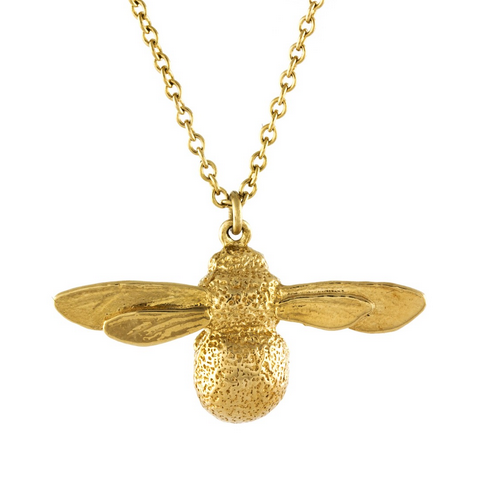 Head over to the Jewellery Curated Summer Holiday page for all this and more. I have been using very high-quality jewelry for a long time. They are quite good and stylish. Very different from other ordinary jewelry and looks really elegant. They are Sleep Tracker, Mood Tracker, Message Reminder etc, which is really good. They do ship worldwide for free, with refund and return options.